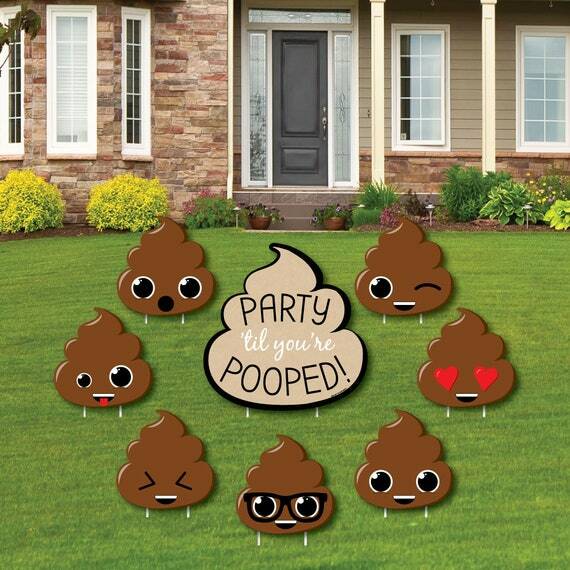 *1 - Large Sign Measure 16.5" x 16.75"
*7 - Poop Measure 10" x 10"
Delight your guests or surprise a friend or neighbor when you decorate their yard or drive with these adorable Party 'Til You're Pooped shapes. This 8-piece set of Party 'Til You're Pooped Western Party lawn decorations is professionally printed in vivid colors to really make a statement wherever they are used. Each shaped outdoor ornament comes with two metal stakes, making it easy to display on lawns, driveways or courtyards. Best of all, Party 'Til You're Pooped shapes are cut separately so you can arrange them any way you please. These decorative yard shapes are made of waterproof plastic and are weather resistant, perfect for short-term display but can be used again and again with proper care. 70th Birthday Party - Water Bottle Sticker Labels - Waterproof Self Stick Labels - Adult 70th - Gold Birthday Favors - 20 Ct.
50th Wedding Anniversary - Water Bottle Sticker Labels - Waterproof Self Stick Labels - We Still Do Anniversary Favors - 20 Ct.